ICLEI – Local Governments for Sustainability and the City of Bellevue Washington, with funding from the U.S. Department of Energy’s Cities Leading through Energy Analysis and Planning (Cities-LEAP) Program, are working to advance the state of the urban sustainability practice by equipping cities to understand and document the drivers of change to community GHG emissions inventory results, whether from external factors or from changes to the efficiency of the activities within the city. 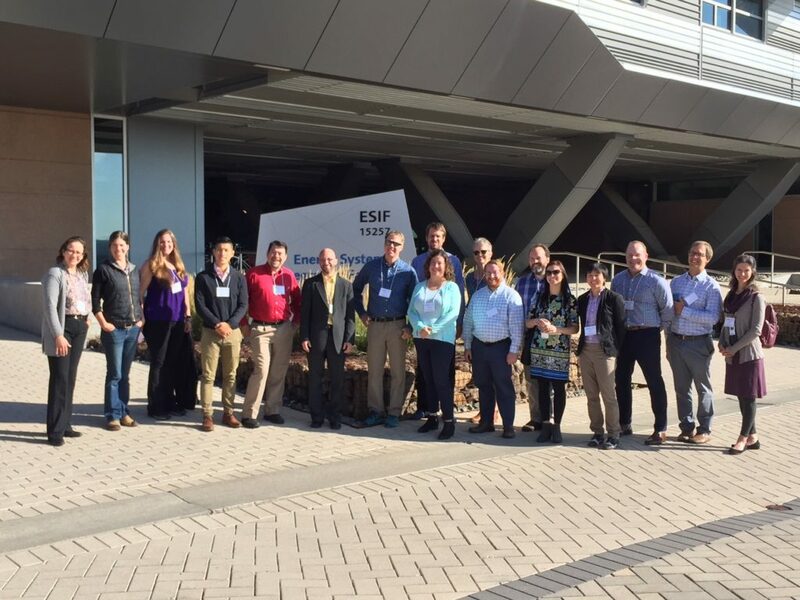 The project enhances the GHG inventory practice by creating methods and tools to attribute changes between two inventories to the impacts of policies and programs along with other external drivers, such as economic activity and weather. This framework will support policy-makers in using data to better communicate about their progress and refine their policy approaches. Specifically, ICLEI has developed a “contribution analysis” that is now in testing by a set of participating communities: Aspen, Santa Monica, King County WA, the Metropolitan Washington (D.C.) Council of Governments, and the Delaware Valley Regional Planning Commission. The approach includes normalization of inventories for heating and cooling degree days, economic activity and other factors. By eliminating as much uncertainty as possible through normalizing for factors like weather and economic activity that isolate out the “noise” of external factors, the impact of actions or programs can be reasonably inferred. Preliminary Contribution Analysis Model Results for the Participating City’s Inventory. The dark line represents the starting inventory emissions in 2011 and the second dark line represents the ending emissions in 2014. 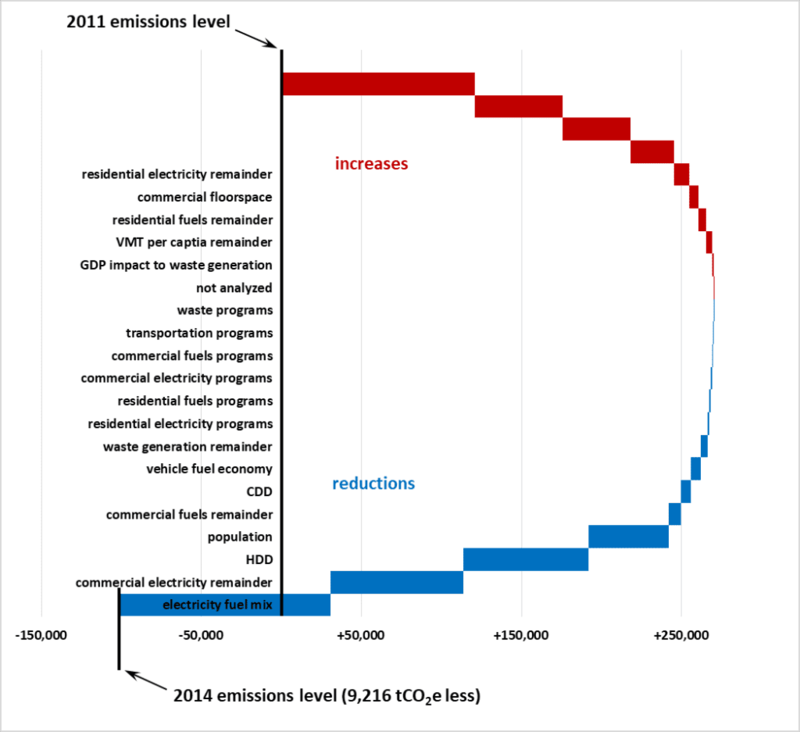 Red represents emissions decrease while blue represents emissions increase; each factor contributed to the inventory total via increasing or decreasing it. The contribution analysis approach will be complimented with program evaluation. The participants evaluate one emissions program or policy; transportation demand management, solar, energy efficiency, etc. The end result of these two approaches will illustrate the drivers of change in those communities. Upon completion of the testing, ICLEI will produce a “replication toolkit” to describe the steps in the process, provide guidance on interpretation of the results, and visual and narrative templates for communities to adopt and take forward. This toolkit will support local governments nationwide in making better, more cost-effective policy decisions by providing a data-driven framework and associated tools for evaluating the contributions of various factors to observed changes in GHG emissions over time. Finally, the new resources will be incorporated into ICLEI’s U.S. Community Protocol for local emissions inventories. The project is expected to complete in early to mid-2018. Contact us for the replication toolkit in mid-2018. Participating steering committee cities: Bellevue WA, King County WA, Metro Washington Council of Governments, Delaware Valley Regional Planning Commission, Aspen CO, Santa Monica CA.